The Lake of the Ozarks encompasses 53,000 acres and has more than 1,150 miles of shoreline. The main channel, the Osage River, is about 100 miles long from Truman Dam to Bagnell Dam. The Lake of the Ozarks, the lake itself, is referred to by mile markers (MM). The Bagnell Dam, which was completed in 1932 to form the lake, would be considered the 0 MM. From there on it goes in increments of miles - 1 MM, 2 MM, 3 MM and so on. The most popular areas are Lake Ozark and Osage Beach which are located on the East side of Lake of the Ozarks near Bagnell Dam. The West side of The Lake encompasses the towns of Camdenton, Sunrise Beach, Laurie, and Gravois Mills. There are several arms, and two rivers, that form the Lake of the Ozarks. Bagnell Dam begins The Lake at the 0 Mile Marker (MM). Each Arm of The Lake has its own set of Mile Markers which start at 0 where the Arm joins the Main Channel. The Osage River is considered the Main Channel of Lake of the Ozarks. Gravois Arm – Enters the main channel at the 6 MM. The Gravois Arm is home several favorite Lakefront Watering Holes including Coconuts, Jolly Rogers, Cabana Jones, and Hillbilly Yacht Club. The Gravois Arm is about 9 miles long. Glaize Arm – Enters The Lake at the 19 MM. The Glaize Arm is home to the “Infamous Party Cove” and is also the least developed portion of The Lake. 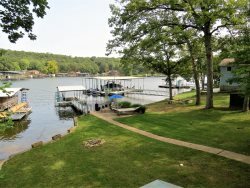 Most of the shoreline of The Glaize Arm is encompassed with The Lake of the Ozarks State Park and offers a great place for water skiing and tubing. The State Park offers camping and three boat launch ramps with public access. The Glaize Arm of The Lake is about 15 miles long. Niangua Arm – Enters The Lake at the 31 MM. The Niangua Arm is one of the rivers that make Lake of the Ozarks. The Lake splits at the 31 MM into the Niangua and Osage Rivers (Arms). The Little Niangua River joins the Niangua Arm at the 8 MM. The Little Niangua will take you to the Ha Ha Tonka Stae Park Area where The Ha Ha Tonka spring dumps 53,000,000 gallons of water into The Lake daily. The Ha Ha Tonka spring is the 12th largest in Missouri. Lake of the Ozarks is a vast area, be sure to give us a call if you need help getting exactly where you want to go. Learn more about the lake, how to get here and the area at large!